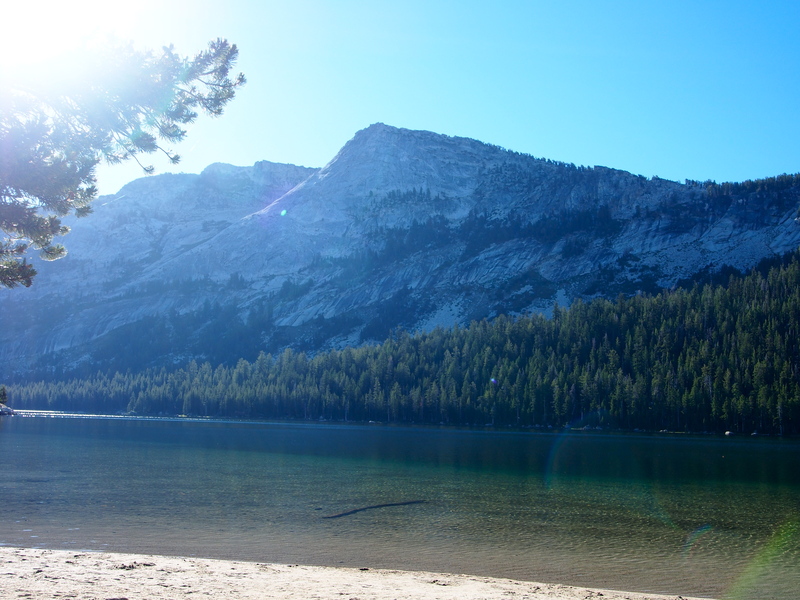 Morning view of the peak from Tenaya lake below. 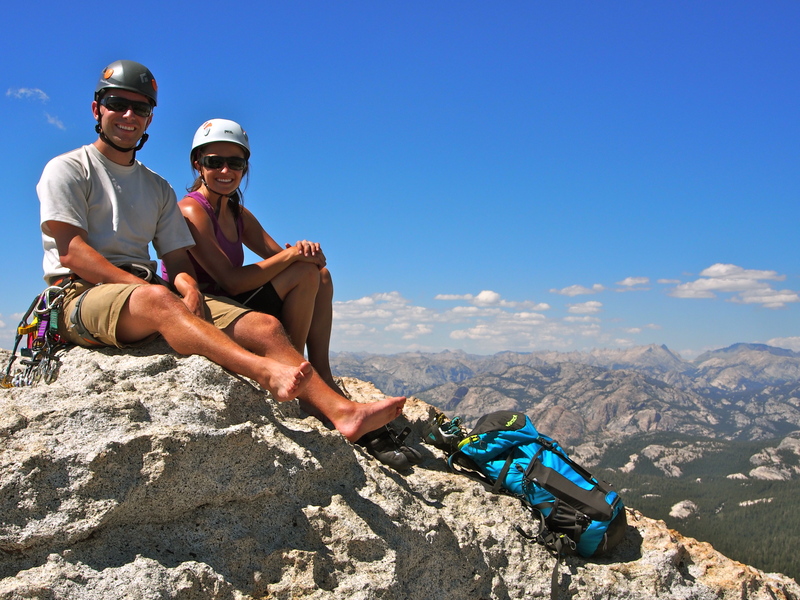 This weekend we headed up to Tenaya peak in Tuolumne Meadows to get in some good multi-pitch trad practice. We camped… ahem…. very legally in the park on Friday night at an undisclosed location after a very late arrival. We got a less than alpine start Saturday morning, but it was going to be a mellow day. The approach TH is a parking lot just on the NE side of Tenaya Lake, and the approach was pretty straightforward because you can scope the peak from the lake below (do this before heading to TH). It did get a little bushwacky the last 200 ft or so with overgrowth and wet rock. We started the approach at 9am and were at the base of the climb around 9:45am. We were able to safely scramble up the first ~5 or so pitches unroped; just felt like slabby 4 class. We then did probably 6 pitches of roped climbing to finish the climb. It was easier to build anchors and place pro than anticipated, so we were able to extend several pitches to get the climb done a bit faster (with a 60m rope). We successfully identified where we were on the climb whenever we bothered to bust out the guidebook, which allowed us to anticipate how much more climbing we had ahead. 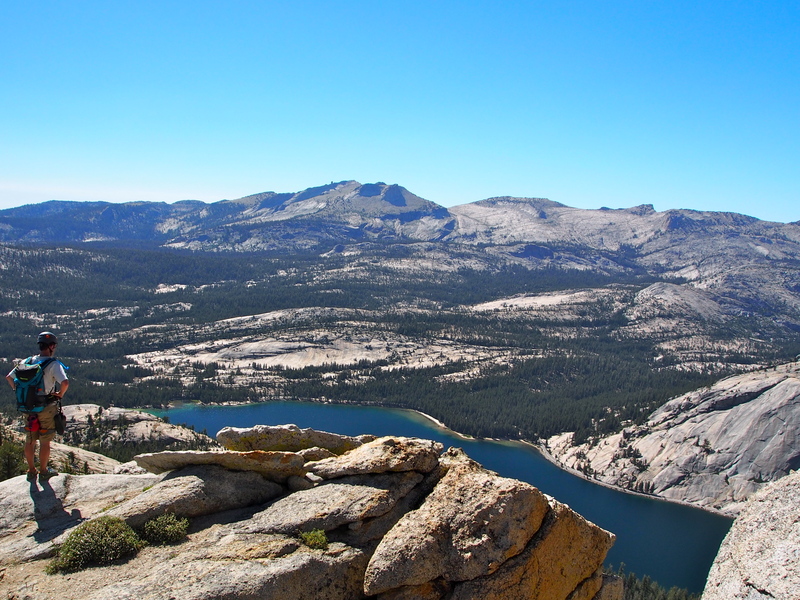 Most importantly, you have spectacular views of Tenaya lake and the Tuolumne region on the whole climb, making it a fun place to hang out on rock all afternoon. 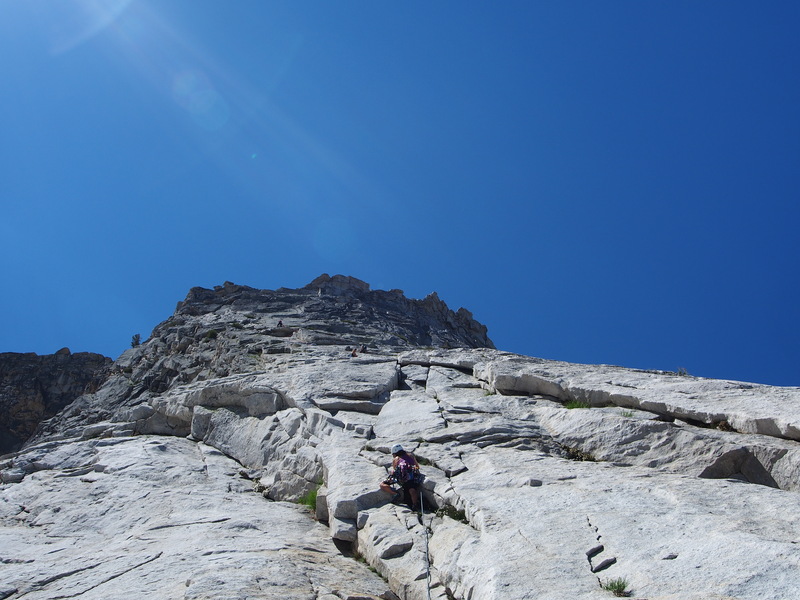 One of the earlier pitches that we roped up for; probably the 5th or 6th pitch in the guidebook. We found that the suggested route that goes off to the left at the top of the climb was kind of a sketchy exposed class 4 traverse (if we went left at the correct time…). It was interesting and fun, but we heard better reviews from people who finished the climb by going relatively straight up through the supposed 5.7ish region. Summit views were stellar and it was a fun spot to chill, chat, and eat some lunch. We forgot to bring summit beers, amateur mistake. Connor scoping the lake below from the summit. We attempted to descend via the “longer, easier alternative” route described in supertopo, but the route was less than clear. We stayed just left of the ridge as long as possible, looking out for the hiking trail, but we ended up getting cliffed out a few times and had to weave our way through strings of rock faces. We ended up just trying to making our way down toward the lake. It was easy to maintain awareness of direction but it was not clear where/if there was a trail we were supposed to be on. The only trail we found was when we had basically arrived at the lake, at which point we connected with the trail that circumnavigates the lake. All told, the descent probably took us 1.5-2 hrs. I am the first to admit that navigating is not our specialty, but the descent just wasn’t that straightforward, and we heard from many other groups that they had similar trouble. It sounds like the better route would be to take the more standard descent and cut over earlier underneath the peak, since you’ll be dealing with scramble/cliffy terrain either way. Still, we were rewarded with cold beers and a swim in the lake when we returned to the car around 5pm. Delightful. 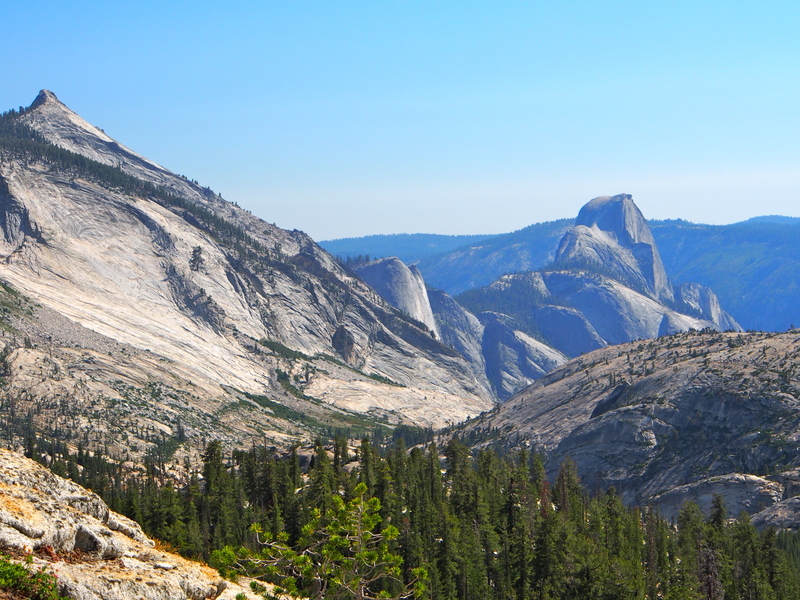 Views of half dome on the descent. Since it was a busy summer weekend, trying to be courteous to other parties on the climb was what slowed us down more than anything. It was fairly crowded, but most were good people who also had a laid back day of easy trad in mind. Some rad dudes even offered us an extra campsite they had (shout out to Ben, Anna, Christian, & friends), so we ended up hangin with them bonfire-style all night. Perfect end to an awesome day. 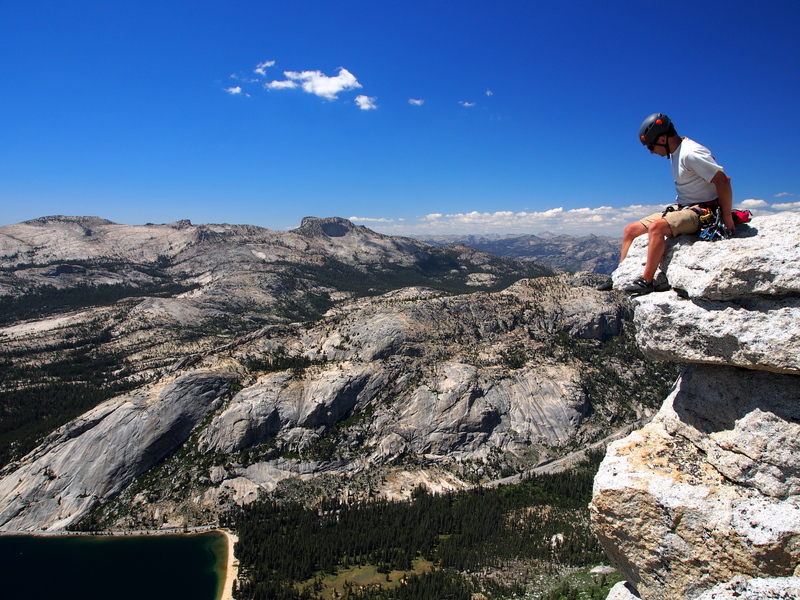 Jeers: 1) Kinda wish we would have done the last pitch straight up rather than the traverse off left, 2) summit beers…. sigh, 3) would take the more common, shorter descent route, cutting earlier underneath the peak. Cheers: lots of easy trad practice for placing gear and building anchors, excellent views on the whole climb, awesome people, and it all ends with beer, swimming, and a party on the beach. Amazeballz. Posted in Trip ReportsBookmark the permalink.